The most important business meetings don’t happen in conference rooms. They tend to be semi-structured conversations over coffee in neutral third party locations like coffee shops. Conversations about non-work topics create the most trust. Seahawks, traffic, travel, whatever. Business is a poor substitute for shared interest in other topics. You can get away with pastry in December. There’s more pastry to be found, people’s expectations for socializing are higher and everyone is in sweaters to hide the consequences. Seattle has world class pastry. 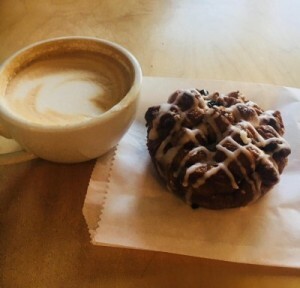 Bakery Nouveau (twice baked croissant), Princi (cornetti al lampone), Volunteer Park Cafe (cherry almond scone), Fresh Flours (pecan cinnamon roll), De Laurenti (chocolate chip cookie). Coffee has always been a stated subject of this blog, along with tech, PR and Seattle. Until now it’s been difficult to find a relevant way to discuss it. To the brave friends who allowed me to document their holiday cheer, thank you for officially bringing coffee and pastry into my job. See you next December.